Where the best of two worlds combine there is Alsatia, a narrow strip of land in eastern France bordering Germany. Its culture is a happy combination of the typical French "joy of life" and the solid, hard-working and efficient character of Germany. This nativity of Alsatian santons is set in a landscape of rolling green hills, beds of blooming flowers, and wispy clouds sailing in the sky. Like in Provençal tradition, the burnt clay figurines reflect various activities and typical local costumes exquisitely painted. There is the lady with the cabbage cart (sauerkraut), the man carrying a block of ice, the girl taking a Gugelhopf (typical Alsatian pastry) to the manger, and the proud Strassbourg lady all dressed up in her Sunday best. The Holy Family almost disappears among the thirty-two personages. The holy couple in local costumes looks much like the ordinary couple they once appeared to be. But they hold each other, and the holy Child rests peacefully in their loving presence. Next to the Holy Family sits the rabbi pondering the scriptures, trying to make sense of this incongruous event. 29 pieces made of sculpted clay and hand-painted. 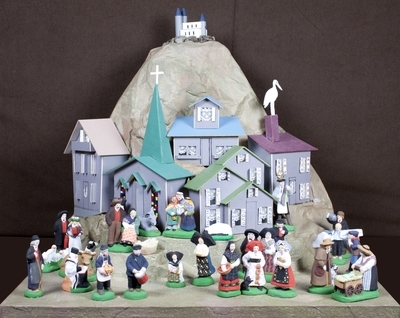 Figurines depict Jesus, Mary, Joseph, and many other people as well as some animals, including sheep, a donkey, and an ox. Exhibition label originally written by Fr. Johann G. Roten, S.M. for exhibit entitled "At The Manger: No Place Like Home" held at Roesch Library, University of Dayton.